This diseases is commonly known as stiff neck and is common reason of pain in the neck. Due to some injury the degeneration may be caused in cervical disc. With the passage of time the degeneration increases and results in severe pain and stiffness in neck. Neck pain is one of the main symptoms of Cervical disc disease. In general the person who is suffering from this problem feels pain in neck and his or her neck becomes inflexible. Pain that you feel as a result of cervical disc disease might be inflammatory, which is due to the release of some chemicals which swells nerve endings in the annulus fibrosus. If your neck has become stiff and you find it difficult to move then it is a clear indication that you have been affected with the cervical disc disease. If this condition persists and you don’t get its proper treatment or you don’t take it seriously then it may further lead to chronic pain, numbness, or weakness in different body parts such as neck, arms and shoulders. 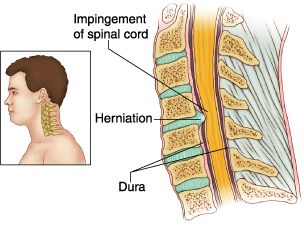 There are different types of medications available for the treatment of cervical disc disease. Let us discuss some of them briefly. Muscle relaxants. Medicines like cyclobenzaprine (Flexeril, Amrix) and methocarbamol (Robaxin) would prove quite effective to get relief from the muscle spasms in neck. Anti-seizure drugs: This group of medications include gabapentin (Neurontin, Gralise, Horizant), and pregabalin (Lyrica). They are used on patients suffering from the pain of damaged nerves. Narcotics: A number of pain killers like hydrocodone (Vicodin, Lortab, others) can work to provide immediate relieve. Similarly oxycodone (Percocet, Roxicet, others) may also be used for the same purpose. Steroid injections: In some cases using steroid injections are also used to get rid of cervical disc disease. All these treatment methods are expensive and are associated with many side effects. The exact causes of problem are not treated and problem usually persists for a long period of time. When you have been annoyed after prolonged allopathy treatment and you are unable to find the right treatment then why don’t you try homeopathic treatment? Homeopathic medicines treat the root cause of this disease and with proper treatment most of the symptoms are gone forever. i am suffering from discs degeneration . My three discs are degenerated and I feel numbness in left hand fingers and some time neck pain. I want to discuss in detail, please send me your email and address. I am 50 years old housewife suffering from Survical disc degenerative disease with bony spurrs in C5-C6-c7 area for last 6 months. I have pain in my neck and right arm and also vertigo. Initially I had numness in right hand fingers also which went away when I wore hard collar for 3 months and took pain killers plus pregabilin. Even light kitchen work adds to pain in right arm. I am upset with vertigo also . Please advise homeopathic medicine with potency, dozes and duration of treatment.